We all love to see the first snowdrops, spotting the bright green leaves spearing their way up through snow or brown leaf litter with a tight pointed bud at the top promising that charm of green patterned underskirt and pure glacier white outer petals. There is the annual surprise that some are doubles, perhaps larger flowered or taller than expected, fragrant or maybe a hybridised variety, possibly unknown until now. It’s all part of their universal charm. But is it my favourite? Well, no – not quite, though sheets of green and white can always make me smile. Instead, in January, I turn to an unsung hero, which flowers modestly yet with a waft of perfume which catches the nose with its honeyed scent when you least expect it. Lonicera x purpusii “Winter Beauty”, the winter honeysuckle, displays pale clusters of flowers on slim bare branches between December and March and then produces bright green leaves which are best used to act as a foil for another climber or as a backdrop for a summer-flowering perennial for the remainder of the year. On mild winter days the flowers will supply a valuable source of nectar for emerging and over-wintering bees and other insects. 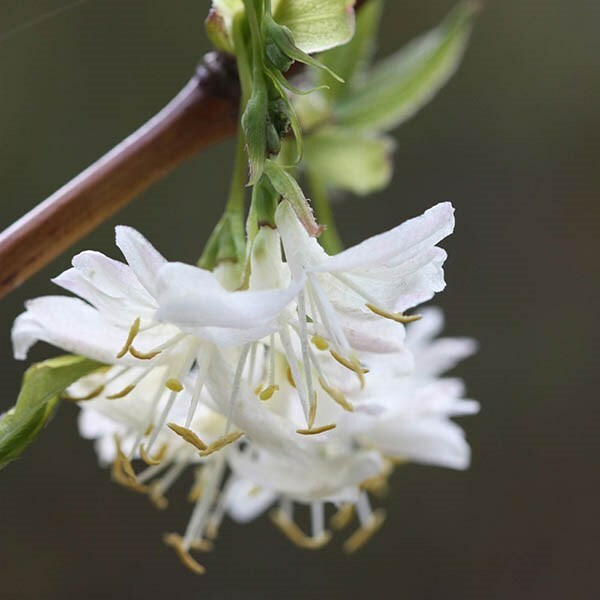 It is a well behaved climber with a height and spread of around 2 metres though, like all Lonicera’s, it will become a tangled mass of wiry stems if neglected. To keep yours happy and healthy, cut it back after flowering, removing a third of the flowering shoots and apply a generous 5-7cm (2-3in) mulch of well-rotted compost or manure around the base of the plant in early spring. In a spring garden pair it with Hellebores, witch hazels and small bulbs to extend the flowering period. Mine grows on a fence where it acts as a companion to Rosa “Albertine” and fills in the space behind small Camellias with blue Aemone blanda at its feet, providing perfume and interest until the rest of the border starts into life.